Every year the Charitable Foundation of Alamance Regional organizes our local Pink Ribbon Luncheon and selects breast cancer survivors to participate in efforts to raise money for the fund. Having recently shot a series of super hero portraits for one of our clients, Photographer and Filmmaker Steve Exum helped event organizers Patty Brothers and Katie Boon by planting the seed for a “Hero Themed” luncheon. We also shot the video stories of survivors Sandy Cobb, Cindy Dixon, Donna Harris, Sara Rich and Rene Lefler documenting their personal battles. To help raise money for the Pink Ribbon Fund, Exum Photography and Bloomatini sponsored a photography project called the Pink Ribbon Super Heroes, which is series of superhero portraits of a group local luncheon entertainers called the “Tutus for Tatas.” Over the last five years, this group has have been an integral part of entertaining attendees at our local pink ribbon luncheon. In keeping with our theme, the team of entertainers put on Superhero costumes and choreographed a skit that brought attendees to tears of laughter. Their skit also involved another piece with all dancers dressed as every day heroes, like nurses, policemen, teachers, doctors, scientist, etc. We have the portraits of these everyday heroes, too. We are selling framed portraits on a live auction site of each of these local celebrity heroes to raise money for the fund. 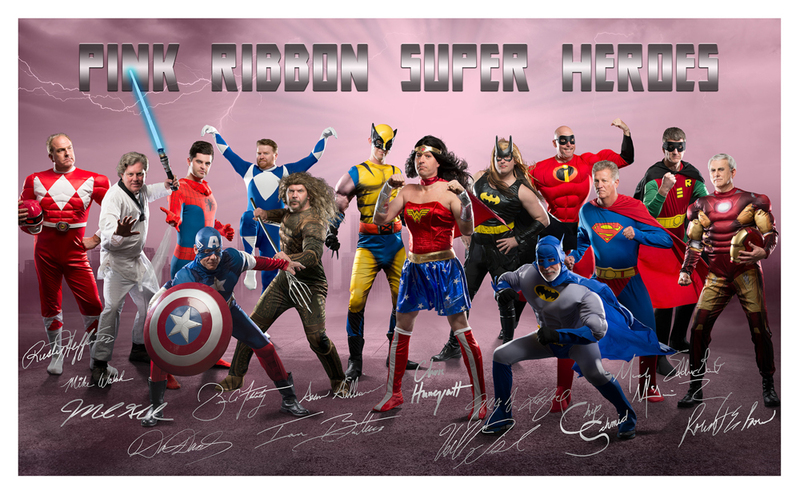 If you are a friend, family member or co-worker of one of our heroes consider helping the Pink Ribbon Fund cause and purchase a framed print of your favorite local hero. The prints can be purchased and shipped to you. Many thanks to the Tutus for Tata dancers Chris Huneycutt, Chip Schmid, Eddie Gant, Brian Flaherty, Rusty Huffines, Greg Lunsford, Mayor Ian Baltitus, Dan Danielly, Michael Garland, Mike Walsh, Robert Boon, Sean Gilliam, Willy Fisher and Mickie McGinn for collaborating with our studio to make this project a success. To see all super heroes & every day heroes, visit our Portfolio. My Alma mater, the University of North Carolina at Chapel Hill has been around a long time. When a department within a university celebrates a 200 year anniversary, the word “longevity” is an understatement. 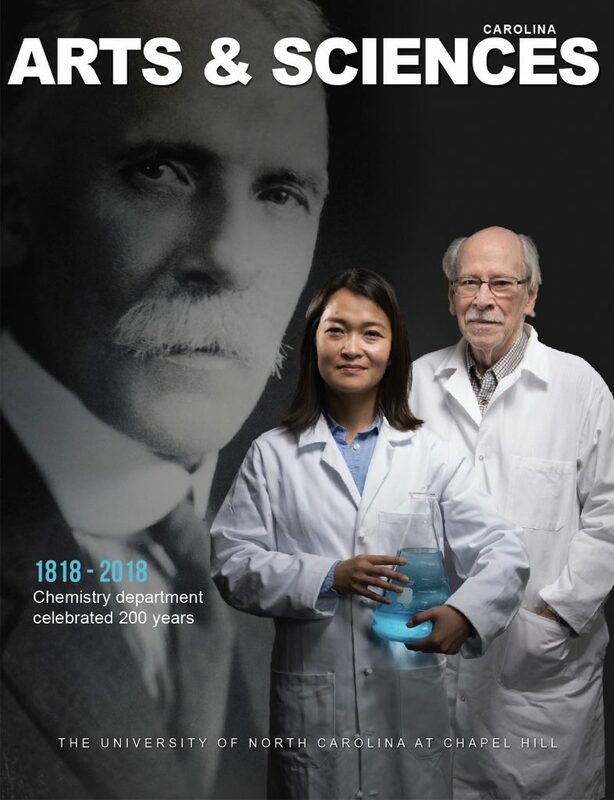 Our commercial photography studio was commissioned by the UNC Arts and Sciences magazine to illustrate the cover story celebrating two centuries of the chemistry department’s influential history. Our studio frequently takes on editorial magazine photography assignments in addition to the marketing photography we do for companies. Steve Exum has been a contributing magazine photographer working for the UNC’s College of Arts and Sciences for more than a decade. 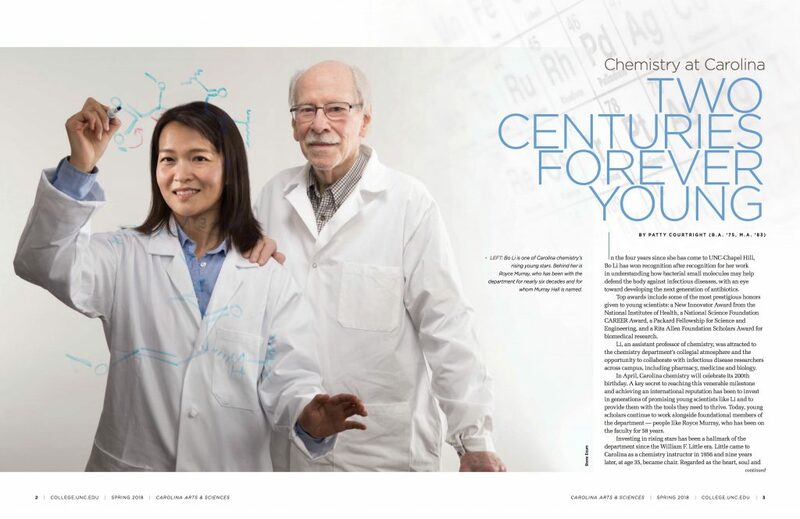 After a few conversations with the editor Kim Spurr and writer Patty Courtwright, our team did some research on early successes of the chemistry department looking for interesting nuggets and possible imagery of significant early faculty. We learned that the founding father of Carolina chemists and early President of UNC Francis P. Venable helped in the discovery of a process for making acetylene gas in 1892. UNC’s Venable Hall is named for this chemistry giant. With the portrait of Francis Venable and information about the successes of current faculty, we proposed a portrait concept combining a historic image of Venable with a portrait of senior faculty and younger faculty within the department. We wanted to illustrate the huge span of time in one magazine cover image. A lot of what our studio does I call “conceptual photography” or more specifically “conceptual portrait photography.” We worked on some mockups and got approval from the magazine. Next, we shot a series of portraits of four UNC chemists mentioned in the story … Royce Murray, Maurice Bursey, Jim Cahoon and Bo Li. Below is our final mock-up with the image of Francis Venable behind a portrait of senior chemist Royce Murray and rising star Bo Li. Ultimately the editorial team decided to eliminate the image of the founder behind the portrait for the cover. Sometimes less is more. The final magazine cover features chemists Bo Li and Royce Murray. It is simple and successfully conveys the central theme of a department’s longevity within our nations oldest public university. 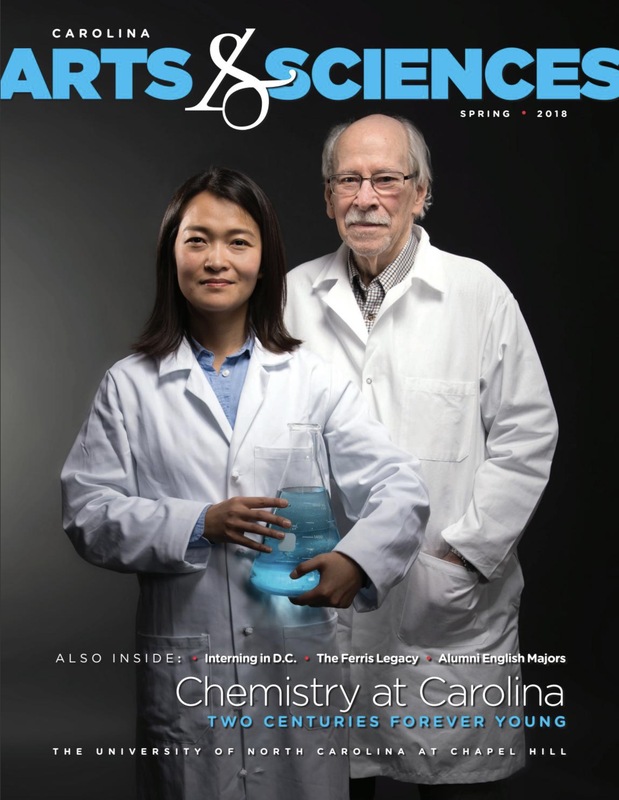 Click here to read more stories about the UNC Chemistry department. Go Heels!